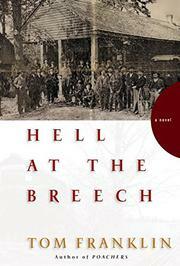 Nightriders seize control of a dark corner of Alabama in a history-based first novel. Clean, unpretentious language laid down in masterly fashion propels Franklin’s (stories: Poachers, 1999) reconstruction of impoverished tenant farmers taking the law, or lack thereof, into their own hands at the end of the 19th century. Their territory is Mitcham Beat, a forlorn section of Clarke county that Sheriff Billy Waite would be just as happy to leave to its own dark management or turn over to his successor in a couple of years when he retires. The few middle-class families that own the cotton farms in Mitcham Beat treat their tenant farmers as ruthlessly as the worst slaveholders in the not-so-remote Old South ever did, and the badly squeezed farmers haven’t a hope of escape from their lives. But Sheriff Waite can no longer ignore the situation in this territory laying the other side of a dense, snake-ridden forest from the more civilized part of the county. Desperate farmers have allied themselves with plain old criminals to form the Hell-at-the-Breech gang, an alliance that will run the few remaining black families out of the area, murder the farmers who openly oppose the gang, and render the overlords impotent. Watching the worst of the action from the front row is 16-year-old Mack Burke, an orphan raised with his older brother William by Widow Gates, the county midwife. Mack and William accidentally set the gang on its murderous path when their bungled midnight holdup of one of the few decent souls in Mitcham Beat led to his death and thence to Mack’s unpaid indenture to Tooch Bedsole, the gang’s mastermind. Goaded by his self-righteous cousin Oscar, the county judge, Sheriff Waite rides reluctantly through the forest to sort things out. Historical fiction as smooth and relentless as the darkest Elmore Leonard. First-rate.